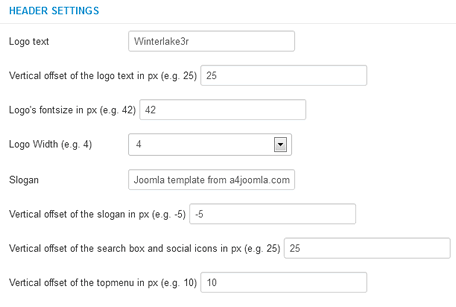 After template installation and choosing it to the default template, click on the template's name in the template manager to set the parameters shown below. The template uses a 12-column grid, so the Logo width, the Right column width, and the Left column width are the number of columns in the 12 column grid. You may have to play with these settings e.g. if the template has a menu to the right of the logo text. 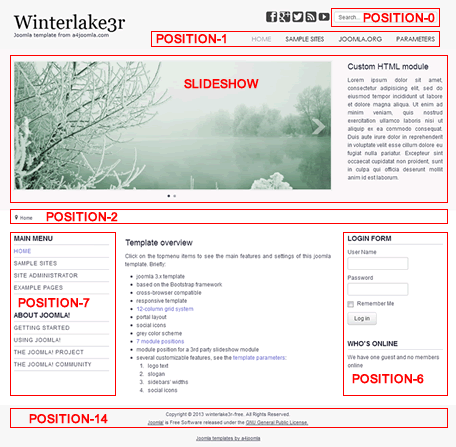 Always check how the site looks when you decrease the browser window size, because the template is responsive, and the look of the site changes with the browser (or display) size. We removed the old built-in slideshow, and use a 3rd party free responsive slideshow module: Ari Image Slider for demonstration purpose on the demo site. It's not part of the template, you have to download it, and set it up in its module settings, not in the template parameters. 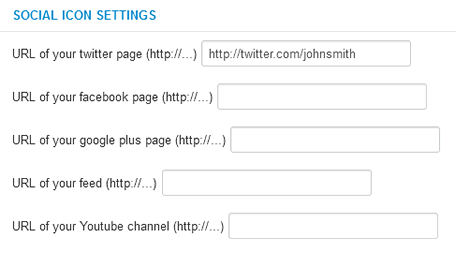 The social icons will be displayed only if you type some URL for their parameters. The slideshow module position can contain more modules side by side. In the module manager remove everything from the "Menu class suffix" and the "Module class suffix" of this module. Set the "Display Labels" to "text" in the module settings, because the other setting is not cross-browser compatible. into the "Module class suffix" if you want to hide a module from mobile phones. You can read more about this topic if you click here. From template version 3.5, you can put your own CSS code into the css/user.css file that you have to create if you need it. If you want to use the less files, don't use the Less compiler joomla plugin, because I found it buggy. I rather used the Winless software, but the main point is to use something that uses the original less.js.